Welcome to this issue of newsletter delivers you updated info. Thank you for your continuously support to RAYSTAR News. 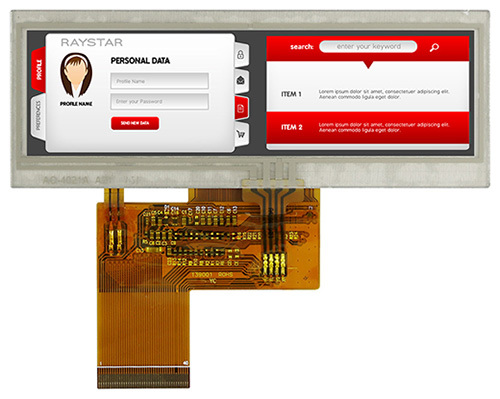 In August, we will introduce Bar type TFT modules & COG modules. 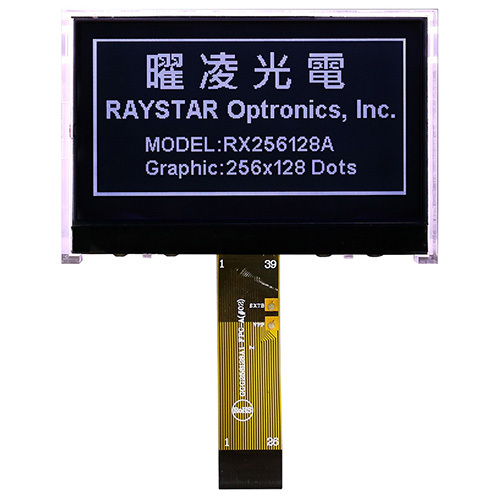 RFS390A-AIW-DNS is a Bar Type 3.9 inch color TFT display module made of resolution 480x128 pixels. This TFT LCD is integrated with a Resistive Touch Screen, having the module dimension of 105.5x40.64 mm and active area size of 95.04x25.34 mm. RFS390A-AIW-DNS supports RGB interface, 3.3V (typical) power supply, supports DE mode and Sync mode. It's View Angle (U/D/R/L) is:50/70/70/70 (typical); brightness is 350 cd/m2. RFS390A-AIW-DNS module can be used in information display device, server system, audio system, industrial device, security equipment which requires display in high quality and colorful image. This TFT-LCD module can be operating at temperatures from -20℃ to +70℃; its storage temperatures range from -30℃ to +80℃. RFS520A-ALW-DNS is a Bar type 5.2 inch TFT LCD display with Resistive Touch Panel, it's a whole new size and resolution of TFT display. 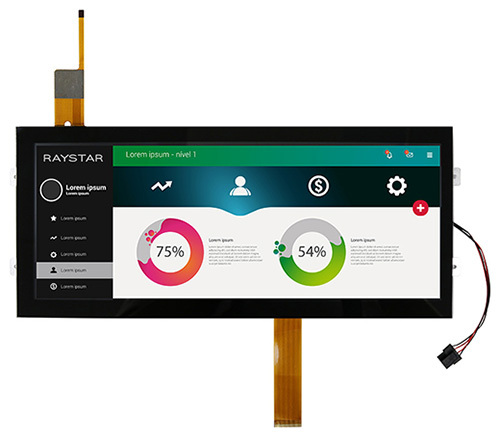 This 5.2 inch TFT display offers high quality and colorful image made of resolution 480x128 pixels; it is especially suitable for industrial equipment & automotive applications, server system, audio system, POS system and advertising display. 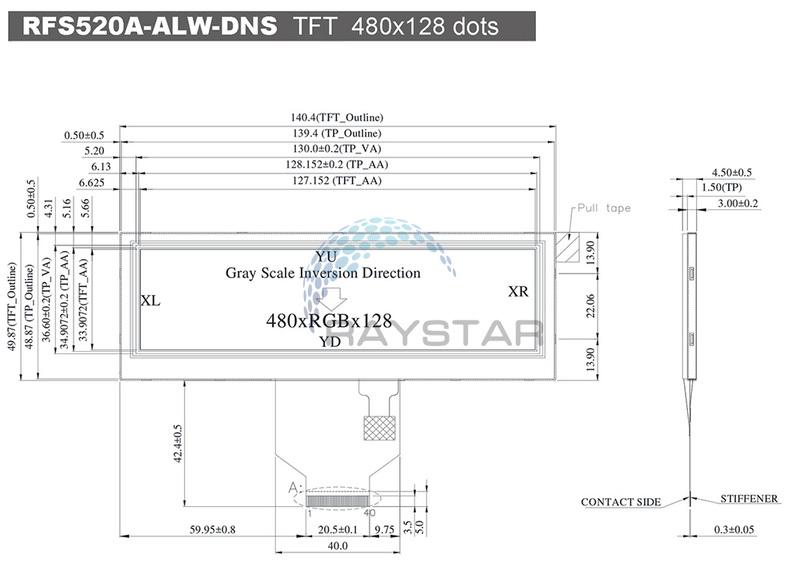 RFS520A-ALW-DNS is having module dimension of 140.4 x 49.87 mm and Active Area of 127.152 x 33.9072 mm which is very close to monochrome STN Graphic RG24064A; both diagonal sizes are 5.2 inch. RFS520A-ALW-DNS is built in with ST7252 or equivalent driver IC. It supports RGB 24 bits parallel interface SYNC mode. If customers need PCB with screw holes on module which is having similar module dimension as RG24064A, you may choose our RFS520Q model. This RFS520A module can be operating at temperatures from -20℃ to +70℃; its storage temperatures range from -30℃ to +80℃. 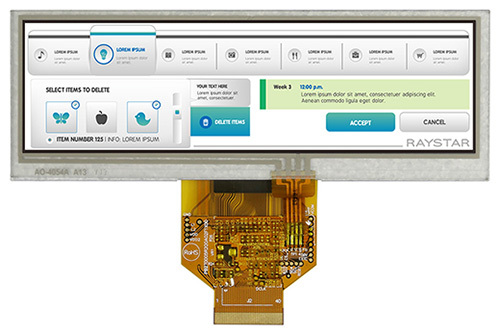 RFY1230A-6WH-LNG is an IPS 12.3 inch TFT-LCD module with Projected Capacitive Touch Screen (PCAP). This TFT-LCD is featured with IPS panel which is having the advantages of wider viewing angle of Left:85 / Right:85 / Up:85 / Down:85 degree (typical) and having HD resolution (1920x720). 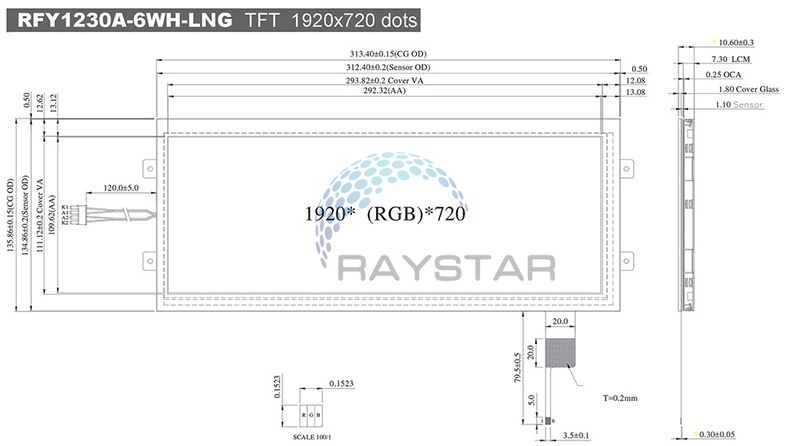 RFY1230A-6WH-LNG is a Bar Type TFT module which is having aspect ratio of 24:9 and its brightness is 800cd/m2. This 12.3” IPS TFT-LCD module is having 2-channel LVDS (2 port LVDS) interface with HD resolution of 1920 x 720 pixels. It is featured with super wide temperature of operating temperatures from 30℃ to +85℃; storage temperatures range from -40℃ to +95℃. 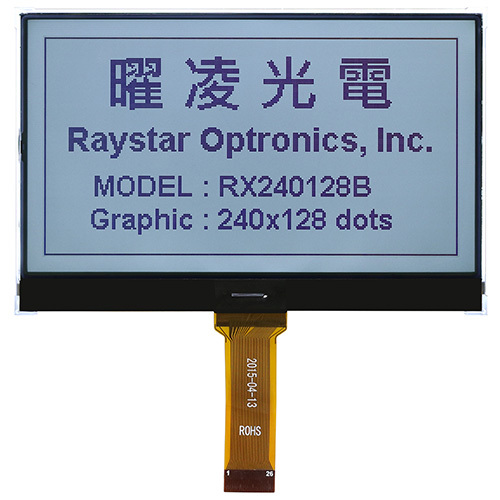 RFY1230A-6WH-LNG is an IPS industrial grade Bar Type with high brightness TFT display modules. It is very suitable for industrial equipment & automotive applications, POS system and advertising display, etc. 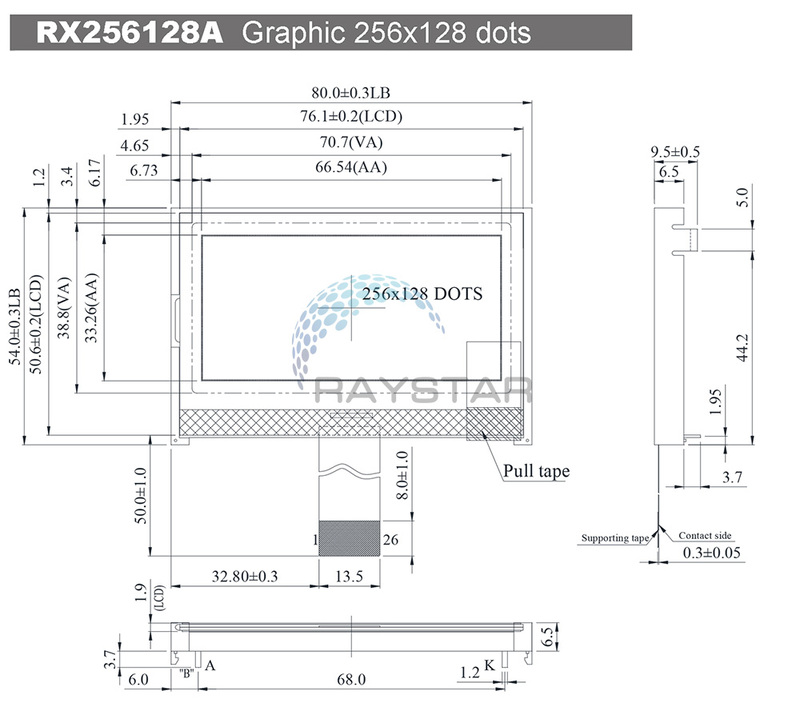 RX256128A is a monochrome graphic LCD module made of 256x128 pixels, diagonal size 2.9 inch. This LCD Module RX256128A is built in with ST75256 controller IC, it supports 6800 8-bit, 8080 8-bit parallel and 4-wire serial SPI and I2C interface. The RX256128A is having the same outline dimension, and VA size and same power supply 3.3V as RX12864D3, but is having a much higher resolution and performance. The RX256128A is an upgrade version of RX12864D3 to meet with the customers’ requirement on higher resolution and the best thing is that the customers don’t have to change the mechanical design for their applications. This module can be operating at temperatures from -20℃ to +70℃; its storage temperatures range from -30℃ to +80℃. The RX256128A is available for different LCD mode options, STN Negative, FSTN Negative (Double film) and FSTN positive and with LED backlight options, like white LED. 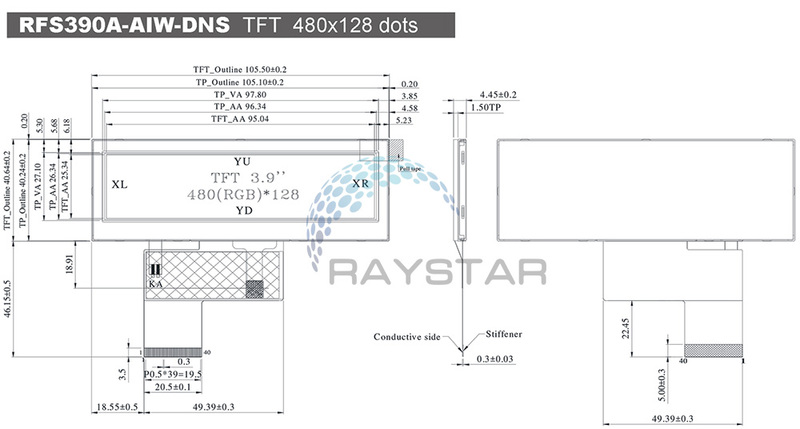 Please contact with us if you need different LCD type and LED combination. 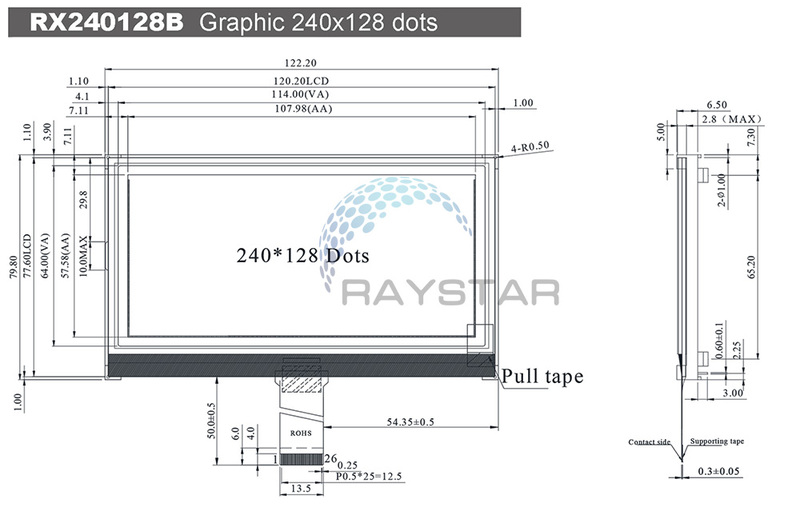 RX240128B is a monochrome COG graphic LCD module made of 240x128 pixels, diagonal size 4.8 inch. This COG LCD Module RX240128B is built in with ST7586S controller IC; it supports 6800 8-bit, 8080 8-bit parallel and 3-line 9-bit /4-line 8-bit serial SPI interface. This COG RX240128B type is having the same Active Area dimension and View Area as COB RG240128B, but RX240128B is much thinner than RG240128B. If the customers require 4.8” thinner module for new design, the RX240128B is a good choice. This RX240128B module can be operating at temperatures from -20℃ to +70℃; its storage temperatures range from -30℃ to +80℃. The RX240128B is available for different LCD mode options; STN Negative blue with white LED backlight, and FSTN positive white with white LED backlight. Please contact with us if you need different LCD type and LED combination.